Google today has announced the rollout of its Real-Time Search technology which will enable users to see the relevant information in search results from information published on Twitter, Facebook, MySpace, FriendFeed and identi.ca. This new search option is also optimized to run on mobile devices such as the iPhone and other Android based devices. This announcement was made today at a news conference held at the Computer History Museum. First, we’re introducing new features that bring your search results to life with a dynamic stream of real-time content from across the web. Now, immediately after conducting a search, you can see live updates from people on popular sites like Twitter and FriendFeed, as well as headlines from news and blog posts published just seconds before. Google Real Time Search will be rolling out in the next few days and will be available globally across all markets. You can try it for yourself today by visiting Google Trends and clicking on any one of the hot topics. This, in most cases will bring you to a page with search results showing the new real-time feature. It is to be noted here that Microsoft Bing already has this feature implemented, in partnership with Facebook and Twitter since October of this year. You may also like to check out: How-to try out the New Upcoming Google Search. You can follow me on twitter or join our facebook fanpage to keep yourself updated on all the latest Google releases. 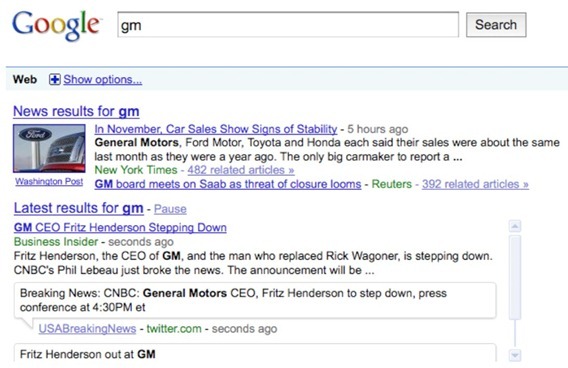 This is a bold, timely move from Google that is likely to lead to a massive shake up in the entire search industry. And what about a timed google search? I just don't care to have as the first result, some news related to my search but dated 6 months or 3 years ago! Above all, with no time stamp on the result listing itself. Real time search has become a buzzword this year..With Twitter increasing its popularity search engines like Bing or Google Search are aiming to make their search results real time or at least closer to that… We have seen some attempts already…Google for instance has included new time based filters for their search results that allow users to search for new content that has been published in the last hour..